1 For Lobster Salad, in a bowl mix together ingredients. Season, if desired, with salt and pepper to taste. Cover and refrigerate. 2 For Crispy Maple Bacon, preheat oven to 400°. Line a baking sheet with foil and a rack. Place bacon on the rack and bake 12 to 15 minutes or until bacon begins to brown. 3 Reduce oven temperature to 350°. In a bowl, mix together syrup and brown sugar. Flip bacon and brush with the sugary maple syrup. Bake 5 minutes, flip and brush the other side, then bake until golden brown. Let cool. 4 For Softly Scrambled Eggs, in a nonstick skillet, melt butter. Slowly cook eggs and cream over low heat, stirring with a heat proof spatula, until eggs are cooked but still slightly runny, about 8 minutes. 5 To Assemble, slather English muffins with butter and toast until golden in pan or on griddle. 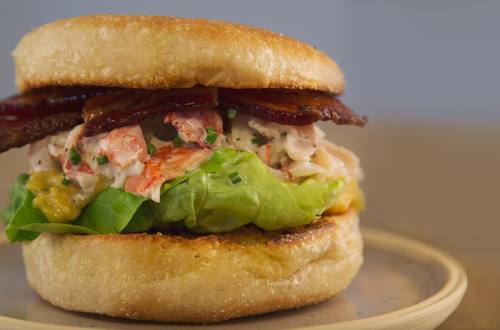 Evenly top toasted English muffin bottoms with butter lettuce, lobster salad, bacon, and muffin tops.